I collect antique and unique salt and pepper shakers – sort of. It would probably be more accurate to say I have a collection of antique shakers thanks to my mother-in-law. Either way, I love cute and fun salt and pepper shakers and I would totally display these ‘two peas in a pod’ shakers if I received them as a gift. These shakers are so cute – and so fun for a garden-themed reception in the spring or summer. They’d also be cute if the newlyweds had a love of gardening or cooking. Or peas, I guess. The shakers come in a cute box so all you need to do is set them out at the reception tables and watch your guests get a good chuckle from this fun and whimsical favor. 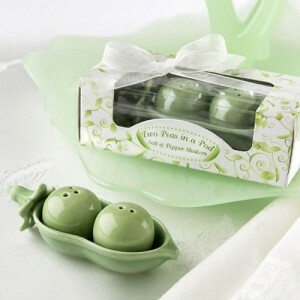 You’ll find the ‘two peas in a pod’ shakers here.